There is a regrettably popular trend in the drag racing world to consider cars purely in terms of their raw performance numbers. Aside from those horsepower or kilowatts, quite a few important factors exist that may bring you victory or defeat on the drag strip. When the tuner team over at Speedkore released this custom Dodge Challenger Demon, they knew exactly what to do to make it the fastest-going example in the world. Aside from the engine upgrade, the vehicle sports a unique all-carbon body that gives it an unprecedentedly low weight. It also takes advantage from a number of transmission tweaks, including a new torque converter, a carbon fiber shaft, and a limiting brace at the rear differential to keep it from sliding off and breaking everything. If it weren’t for these changes, the car would have it much harder on the drag strip. Remarkably enough, the team did not even fiddle much with the stock 6.2-liter V8 engine of the car, only adding a couple of turbine chargers to the setup. The result is a fantastic 1,203 horsepower (897 kW) when measured at the rear axle. 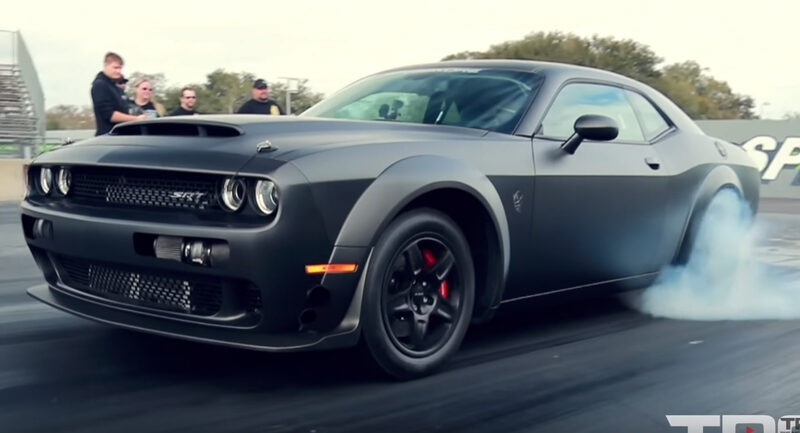 The pimped-out Dodge Challenger Demon has recently run a quarter mile strip in 8.7 seconds, accelerating to 260 km/h (162 mph) as it did so.